Welcome to our 20th episode in our newer podcast series where we cover everything related to investing in tax-delinquent real estate. As a husband and wife investing team, we’ve done nearly 3,500 deals – in land and houses – with little competition and big profits. And we want to share what we know with you. In today’s episode, we’re talking about the awesome and proven coaching program we offer. And specifically, we’re going to tell you about a woman who transformed her life thanks to the success she saw from the results of going through our program and the 1-on-1 training we gave her. We’re highlighting her story and her success to show you why and how our program worked for her and how it can work for you too. This really shows you that our process – our systems – actually do work. Jack: …And, Jack Bosch. 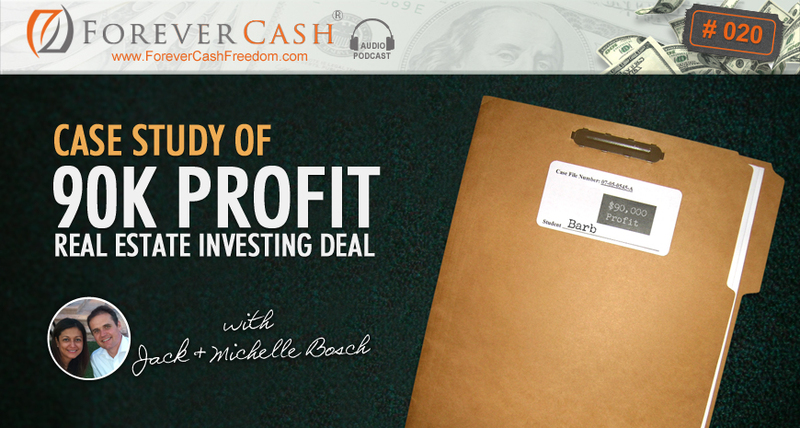 And, welcome to the Forever Cash Real Estate Investing Podcast. Michelle, what are we going to talk about today? Michelle: Well, today, I would love to talk about a lady that we met. I think we met her in person for the first time back in December. Is that correct? Or, was it earlier this year? Jack: Yes, that’s correct. Earlier this year, I believe. Jack: This podcast is going to be about what the result of her coaching program was. Jack: All right. Wonderful, I love it! And, I love that deal because I know which deal you’re going to talk about, and it blew me away when I heard about that deal so stay tuned for that. But, before we get started with that, I want to just quickly tell you that you can get our meeting notes and actually our podcast notes on ForeverCash.com/Podcast. So, the transcript of this podcast, any links that we mention here, if we mention any, will be available there. Any kind of things like that, you can get at ForeverCash.com/Podcast. Also, if you’re listening to this on iTunes.com or if you don’t have an Apple phone, you can also download the actual podcast, the mp3 right there in ForeverCash.com/Podcast, and then download it down to your mp3 player, and then listen to it that way. Also, as always, if this is the first time you’re with us at the podcast, I want to mention to you that we have a gift for you, a free gift of a free course showing our exact way of real estate investing which we call tax delinquent real estate investing, which is basically has to do with people not paying their property taxes. So, when people don’t pay their property taxes, their counties in their states will do one of two things. They either sell their property at an auction which is called the tax deed process, or they sell a lien against that property, and then the lien holder, the investor can down the road foreclose on that property. And, if he doesn’t get to foreclose because the owner pays the property taxes, he gets a high interest rate. So, we looked at that when we started out. We liked it, but we didn’t like that in the tax lien world, we had to wait for several years before we can foreclose on a property. And, in the tax deed world, we didn’t like that there was a lot of competition. So, we developed our own method to go around these auctions, go directly to the owners of these properties before they go to auction when they only have months of tax delinquencies and when they just got delinquent or anywhere in between and basically strike a deal with them ourselves directly without the competition from the auctions and without having to wait for years. And, that has proven to be very, very good to us. As a result, we have done have 3,000 plus deals going on 3,500 with that exact technique. And, it makes total sense because if somebody stops paying their property taxes because they either have no money or they don’t want the property anymore, why in the world would we want to wait for years until we beat a bunch of competition at the auction? Why not go directly to the owner? And, that’s effectively what we’ve been doing, and with that, we have done several thousand deals. Now, with that, obviously we have courses. You can find out about them at JackBosch.com, at ForeverCash.com at the different places. And, we have courses. We have done this a lot with land and we have done this a lot with houses too. So, we have particularly two courses: one for land and one for houses. We have obviously also coaching programs and things like that. If you’re interested in any of that, let us know. Just basically go to Forever Cash. Well, the free gift, I haven’t actually told you where you can get the free gift. Jack: The free gift is at ForeverCashFreedom.com. Again, ForeverCashFreedom.com. And, if you’re interested in any of our programs, you can also call us at (602) 712-0182. Again, (602) 712-0182. But now, to the case that Michelle just talked about, so let’s dive into that. This is the story of Barbara. Where does Barbara live, Michelle? Michelle: Barbara lives in the Northeast. Jack: In New Hampshire, right? Michelle: In New Hampshire. She is the most wonderful, soft-spoken lady but that doesn’t mean that she’s tough as nails. I mean, she is incredible. And, I know that she had purchased our course. She had dabbled in it, and life, as it happens to most of us, gets in the way. But then, she recommitted. She did not give up and she decided to join actually our coaching program. Jack: Which is a six-month coaching program. Michelle: Which is a six-month coaching program. Jack: With a one-on-one with a coach that… And, by the way, our coaches are only people that actually either have gone through our coaching program or have been doing real estate deals our way for years and years and years. Jack: So, we only have full-time investors as coaches and that guarantees that we actually deliver a top-notch coaching program. Jack: And, on top of it, it is also guided electronically by us with modules, with videos, with things that I have created personally and specifically to guide people through or to guide our students through this coaching program such that if they follow all our steps, success is virtually guaranteed. Michelle: Yes. In addition, she also came to a two-day event personally with Jack and myself, and it was a one-on-one and basically private coaching with her for the full two days. Michelle: And, during those two days, we created a plan for her to really make this happen. I remember her saying that sometimes, like I said earlier, life gets in the way but that she was committing. Jack: That’s a contractor thing. Jack: During those two days, can you explain a little bit, what did we do during those two days with her? Michelle: So during those two days, what we do usually as we’re doing one-on-one with you is we help you identify any area to go after, to actually go out and invest. Because you can be doing all the right things and having all the right tactics but if you’re in the wrong area, you’re not going to get the results. Jack: Right! I remember a good friend of ours in Miami who wanted to get house flipping done for a while and he tried it for quite a while and he just wasn’t successful. And, all he needed to do was switch about three miles north from one neighborhood to another neighborhood and boom! Deals started clicking. And again, he did that by joining our coaching program and learning how to do this. But, go ahead. Jack: Well, sorry. We were talking about the two days though. Michelle: We showed her also how to go about basically acquiring the list of properties and how to really in-depth analyze that list. Jack: To find the gems. Michelle: To find the gems, absolutely. Filter her list, and then more than anything, set the expectation on the level of mailing that she needed to be doing in order to get the results that she wanted. Then, we moved on to explaining to her what it would take in order for her to create and generate momentum in her business, meaning it’s a matter of planning and scheduling so that once you go through the entire cycle of a deal, you’re not left at ground zero again having to restart the engine and getting more phone calls in, but how to keep the momentum of phone calls always coming in while you’re working deals all the way down through the cycle. And so, we explained to her a little bit about… Well, a lot of in-depth on how to leverage technology to basically be able to handle a larger volume of deals. This way, she doesn’t go from… She goes from a wannabe investor straight into a professional investor and not just a hobby investor. Michelle: Absolutely! Yeah, the capability involves the tools, the confidence, the leadership, the direction and the clarity to accomplish that. And then, we also were able to really get her to internalize how to analyze a deal because that’s another key thing. You may be in the right area and you may be having the right volume of calls, but when you’re ready to prepare an offer and make an offer, you’re either not doing your comp analysis well or you’re not really researching the area or the property well. And basically, you are not able to materialize the profits because you’re offering too high or you’re offering too low and nothing is getting accepted or you’re offering too high and you’re not basically having the margins that you need in order to turn that property. So, deal analysis is very, very important. And then finally, we went through with her on how to market her properties and how to create structured rhythms of success for the purchasing and the selling that really aligned with her lifetime goals and what she wants to get out of life over the next 5, 10, 15 or 20 years. Jack: In her case, I think she was living in a cabin actually, out more in like the rural areas and she wanted to buy a house close to where her mother lives so she could be close to her mom and her mom doesn’t live far way but it’s still a bit of a drive. So, she figured she needed about $300,000 or so in cash to buy that house so that she would be… And then obviously, everything on top of it would be the income to live off, so good. So, we identified a clear target for that and we identified with her a timeline for it. And then, she went home and she started the six months coaching program with a coach, where there’s regular phone calls and regular modules that she needs to go through and homework and check lists that she needs to check off the things that she’s done so that she knows she has the success, experiences and milestones, that every week, every two weeks, she checks something off and she knows she’s advancing towards that goal of making that first deal happen, and then afterwards obviously many more deals. So, let’s talk about that first deal of hers. I’m really excited about that. Michelle: So, that first deal came to her and it kind of looked like… Well, it looks exactly like this. Jack: So, she sends some letters out. Michelle: She sends some letters out. Jack: People called her back, and then one couple called her back and said what? Jack: And, the sellers knew that, by the way. Michelle: And, the sellers knew that. Yeah, exactly. Jack: It wasn’t like that they were oblivious to what the property was worth. They absolutely knew that. They didn’t want their property anymore, but they didn’t just want it to let it go. They wanted to give it somebody that they liked and this is a key point. So, when you talk to your sellers, don’t just treat it as a transaction. Listen to them. Talk to them. Build rapport with them. And when you do that, you actually get, in some cases, smoking deals because they give it to you over somebody else because they like you. Michelle: Yeah. And so, what you just said is very, very important. It’s like you can see this other person as just a transaction or you can see the other person on the other line as a human just like you who is looking for transformation. It’s just like you want to transform your financial landscape. They’re looking to transform their current situation as well, and either relieve them of the burden of property ownership or relieve them in some way in terms of finances as well. But, if you start looking at things not just on a transactional level but, “How can I basically create a win-win for everyone here and make this a transformation?” People are going to not just like you but they are going to trust you and because they trust you, they’re going to sell your property over anyone else. And, in this case, Barbara didn’t have any competition. But, if there were a couple of other people addressing them regarding that exact same property, I’m pretty sure that the way Barbara handled this situation would have made them pick her over any other one else. Jack: Actually, I wanted to jump in just for one second here. Jack: Once she did her research, she found out that a similar property that actually was smaller than this one had not too long ago sold for $150,000 to a builder in the area. Jack: Now, with that information, because there is not that many kind of properties in that size around so getting comparable was a little bit harder, but she saw that one or two properties that were actually smaller than hers had sold for $150,000. So, based on that, she realized that this property potentially is worth $150,000, $175,000 on a good day. So, she was excited about that, yet at the same time, she didn’t have the money to pay like a substantial amount for these properties. I mean, if the property is worth $175,000, what would you expect you would need to pay to get it? If you’re thinking like a realtor or if you’re thinking like a normal person, you think like, “Well, if it’s worth $150, perhaps I can get it for $120, $130, or perhaps I can get it for $100 if you’re really aggressive.” No, but this story turns to be quite different. She didn’t pay $150. She didn’t pay $100. Go ahead, Michelle. Michelle: She made the whopping offer of $3,000. And guess what? It got accepted. Jack: $3,000. You didn’t hear that wrong. You don’t have to rewind. 3-0-0-0, $3,000 for the property because the seller said all the right things. Because when you listen to the sellers in your conversations, which obviously were detailed in our programs on how the typical conversation with the seller works that you want to hear. If the seller says, “You know what? We don’t want it. Our kids don’t want it. We really wanted to give it to someone that we know. We don’t want much money for it.” Well, that’s what you want to hear and that’s what she heard. And so, she arranged a $3000 purchase price with the people. Michelle: Yup. And so then, she had her accept the contract, and then in the moment she had that property under contract, she turned around and got busy. She got busy marketing the property. Like we said earlier, actually Barb is a contractor up in the northeast area in New Hampshire. And, I know that she had realized that that smaller property that was her comp had been sold to a builder. So, she knew that she could probably tap into and leverage her existing network of builders who she has worked in the past, and she was able to do exactly just that. Jack: She did buy the property first. Jack: She paid the $3000 and got the title, free and clear title. She’s now the owner of the property worth $120, $150, $175 for $3000, and then she did exactly that. She got busy and she marketed. Michelle: Yeah. But, you don’t have to wait until the property is closed. If you know that the title comes back clean, that you are scheduled to close in a week or two weeks from now, that shouldn’t stop you from starting the marketing aspect of that property. You can start the moment you have it under contract and the title looks good and there is no reason to doubt that your seller is not going to go through with the transaction. It’s a great idea to start marketing the property. Michelle: And so, that’s what she did. Michelle: …So that there was enough money in the deal left for the builder for it to be transformational for the builders. Jack: Absolutely! Now, the last thing we know right now is that she has an offer on the table from the builder. I think they’re in an escrow right now. But, the last thing I know is that she actually went back to the builder with a $95,000 counter-offer so that they actually can make the deal happen because she wanted to net after everything at least $90,000 profit. But, to your point, that’s exactly right. She could have probably held out and sold this property for $150,000 over the next year or two years or so. But, we are of the opinion that sometimes it’s good to hold on to these properties and get the top market value for it. That’s particularly true if you’re in a very good financial situation. Michelle: And, if you’re looking to park your money and have a great return. Jack: Exactly! If you have a bunch of money and you get a deal like that pack it, park it. Put it up for the realtor for $175,000. It might take you a year or two to sell it because in this case, it was a piece of land. And then, when it sells, you have a super slamdunk, hall of fame slamdunk, whatever. But, if you’re not in that situation, if you’re starting out and your bank account is rather thin, then what is much more important is to build up that bank account quicker, and then wholesaling is a much better way to do this. So in this case, Barbara decided for wholesaling, and because it was her first deal that she got, and it’s $90,000 in her bank account. Boom! How many more deals does she have to do to reach her goal of $300,000 and that house close to her mom’s? Well, not that many. Even if you take into consideration taxes that she has to pay, she has to do like four deals like that. So, what can she do next? Go right back to that same area and see if she can find some more properties in there, to ask the builder where he’s looking for properties, what he is willing to pay for them, and if he’s on average willing to pay $100 grand, it means she can now go and afford to pay $20,000, $30,000, $50,000 for similar properties in similar areas and flip them to the same builder again. And so basically, with that first deal, she has found an area that she can make massive profits and she’s already a quarter away or actually almost a third or a quarter to her goal of having that house next to her mom. I mean, I’m super excited for her. It’s a smoking deal. I was dancing. We were dancing in the living room being excited for her. Jack: We’re being excited about the success of our students and yet one more student that is out there showing how well our systems work. Michelle: Yes. So, for any of the ladies listening to this podcast, you can do it and you can do it now because the time is now to take control of your financial life. And, if you are a guy listening to this, just take example from the ladies. It can be done. Jack: And, to the ladies, a man is not a plan as I always say. Michelle: Yes. That’s exactly my motto. Jack: Right! Michelle is a strong businesswoman in her own right and I wouldn’t want it any other way and Barbara is the same thing. Jack: So, with that, that’s what we do. Now, the last thing I know from Barbara is that probably she’s also going to be at our next live event which happens in Phoenix, Arizona on August 21st to the 23rd, 2015. If you want to meet her, if you want to meet us, I would love to see you there because one of the things that makes our events really spectacular, I think, or really different in the sense is that I would put up our event against any other event of any other real estate kind of guru or teacher or whatever you want to call them, because in our event there is an average 20 to 30% and sometimes even more of the people in the audience that are already actively doing deals. Many of them have just gotten their program a few weeks ago and they are already actively doing deals because our way of doing real estate is what I call “Real Estate Made Simple.” It’s the simplification of real estate because we’re dealing with houses or land that our owners don’t want anymore. We’re dealing with buyers that are craving these properties. We’re dealing with wholesaling. We’re dealing with deals that we don’t have to use much money or any money for that matter. We don’t have to actually buy those properties in some cases. We actually don’t have to ever take on a mortgage and so on and so forth. And, at our live event, there are tons of people who are actively already doing deals and you’ll see me standing up there in front asking like, “Who in the room has already done a deal?” and about 20, 30% of the hands going up and it always puts a smile on my face because I’ve been to a lot of other real estate events, and I’ve never, ever seen any other teacher do that because… Why don’t do they do that? Because they are afraid that nobody would raise their hand because their stuff doesn’t work. Michelle: …And, really are about transformation and not just transaction. Jack: Right! And, I met one student last time that basically said he’s making about $150 to $200,000 a year applying this methods part-time a year while still doing other things during his life and taking three to four months off a year. So basically, in eight months of the year, applying this part-time makes $150,000. Now, this is not a disclaimer. This is not typical. If you don’t do anything, you don’t make any money, so we want to be very clear that that was an example. That was one of the larger examples that come across our table. Not every deal is a $90,000 deal. Your first deal might be a $2,000 deal or a $3,000 deal. Michelle: But, just because that deal is $2,000 and not $90,000, it doesn’t mean that that deal is not just important. Those small deals, those small successes, those smalls wins, those are the ones that really sculpt your spirit so that when the $90,000 ones come around, you can really think from the point of view of it being a transformational deal and transactional for everyone and not just a one-time thing. Michelle: So, those small ones are really just as important as the big ones. Jack: Exactly right. So, they really give you that confidence. Particularly, our first deal made us $3,600. Our very first deal is $3,600, but I remember it to this day as if it was yesterday because it made the difference between trusting that this would work and figuring out that it would work and knowing it would work. Jack: And, that difference is the one from trying to winning, from doing the first step to going over the finish line. At that moment, we knew we can do this and that anyone can never ever take that away from you ever, ever again. Jack: So, it created confidence like nothing else ever before and it wasn’t the $90,000 deals. We have done $90,000 deals, but this one was a $3,600 deal and it made all the difference in our lives. We’ve probably going to do another podcast about that, just about our first deal. I’ll tell you the story of how we were scared, how we did everything wrong, and how we still made $3,600 in that deal. All right. So, with that… Also, I talked about a live event. I want to invite you to our live event. Our live event typically is not cheap. It costs $1,000 but because you are one of my podcast listeners, I’m going to make you a once in a life time offer to actually get that ticket at about 70%, 80% discount and you can do that by going to ForeverCash.com/PodcastLiveTickets. Again, it’s ForeverCash.com/PodcastLiveTickets. If you go there, you get the ticket for just I think $297 and you get to come, you get to enjoy being surrounded by a hundred other people of which 20%, 30% are already doing their deals. The rest is brand-new people that just started, and they’re going to be doing deals afterwards, because after you come to my event you have the all the tools that you need to be 100% successful. Michelle is going to be there. It’s in Phoenix, Arizona. We have a great hotel with super low rates at $79 a night, so we made sure that’s its affordable for everyone to come here. All right? Michelle: Also, if you like this podcast, please go ahead and do rate us. Give us one star if we sucked. Give us five stars if you liked it. Ideally five stars, please? And also, I wanted to mention, if you want to interact or have any questions for us, you can go to our ForeverCash.com… Actually Facebook page, Forever Cash Facebook page, and basically ask us any questions. Jack: Which is on Facebook.com/ForeverCashLife. Michelle: Yeah. And, we will probably address any question you might have in future ongoing podcasts. Jack: All right. So with that, again last time, get your free course at ForeverCashFreedom.com, but all these things are actually on our podcast website, so all of the transcripts, the links, the downloads, everything is available in ForeverCash.com/Podcast. With that, I say goodbye.